The former Palestinian Prime Minister Ismail Haniya of Hamas says his group is ready to talk to its Fatah rivals. He was reacting to a call from Egyptian President Hosni Mubarak for a resumption of dialogue between the two Palestinian factions. Mr Mubarak was speaking at a summit in Egypt of four Middle Eastern leaders. Earlier at the summit, Israeli Prime Minister Ehud Olmert said he would ask his cabinet to release 250 jailed member of the Fatah movement. The meeting in Sharm el-Sheikh brought together Mr Olmert, Mr Abbas, Mr Mubarak and King Abdullah of Jordan. 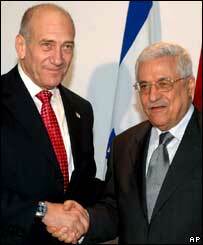 The meeting was aimed at boosting Mr Abbas and isolating his rivals, Hamas, after their takeover of Gaza. Earlier, the Hamas captors of Israeli soldier Gilad Shalit broadcast what they say is his first audio message. Cpl Shalit has been held for a year after being seized by militants near the border between Gaza and Israel. 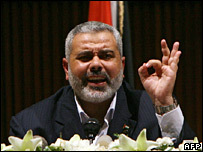 A spokesman for Mr Haniya in Gaza said Hamas was "disposed to immediately take up this dialogue" urged by Mr Mubarak. The Egyptian leader called for a "resumption of dialogue between all the children of Palestine, and the achievement of a common position that speaks for its people and its cause". Mr Olmert told the gathering: "As a gesture of goodwill towards the Palestinians, I will bring before the Israeli cabinet a proposal to free 250 Fatah prisoners who do not have blood on their hands." He added that those freed would have to sign a commitment not to return to violence. About 10,000 Palestinian prisoners are being held in Israeli jails, some without charge. For his part, Mr Abbas urged Israel to "start serious political negotiations, according to an agreed timeframe, with the aim of setting up an independent Palestinian state. "My hand is stretched to the Israeli people," he said. Although Mr Abbas may have received much of the support he was seeking, it may not make any difference on the ground says the BBC's Heba Saleh at the summit. Hamas is still in control of Gaza and that undermines any serious prospect of peace talks, says our correspondent.